That looks fantastic! I love the leaf fabric also! THAT LEAF PRINT IS AWESOME. So is the small flower one. That sure is pretty! Nothing like a little spring...to put the bounce in your step! 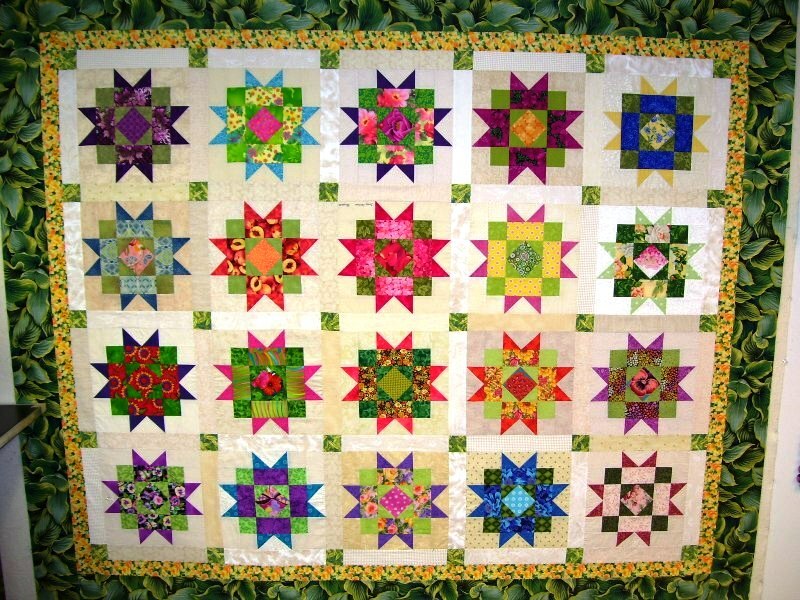 This quilt is positively wonderful!!!! :cool: i wish i had participated...its a beauty! p.s....due to inspiration you provided....i loaded my sisters choice this afternoon! Very pretty, love all the colors and the leafy border really pulls it all together. p.s....i loaded my sisters choice this afternoon! Awesome, aren't you having a productive day! Love that leaf fabric too! Very nice quilt top, great color combos. Love the Hosta leaves of your outer border.... so life-like! I thought you had laid your quilt top on a bed of hostas..... cool! Beautiful! Man, I need to get that one done!!!! Really pretty! And WOW did you get a lot done in one day!